yea it’s there for something but my trucks didn’t have the option there are a few different wireing plugs I’ve found that aren’t used on mine. I am reasonably sure that plug is for the optional tachometer. That plug sits on the underside of the dash I believe....not 100% sure but think it is a diagnostic port for the dealer to plug in and read any of the early basic codes from the ECM? I know my 93 wiring has one down there and it is not for the tach. 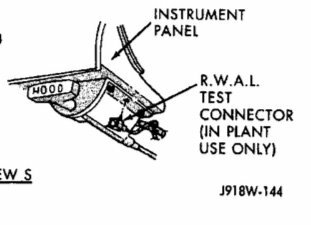 I thought I remembered the tach kit instructions (for '92 & '93) referring to a plug in the wiring harness in that area, but I believe the above is that to which you were referring . . . So, my apologies. Diagnostic/test port for the ABS module/system. Help - Hood Release on first gen Dodge broke!